India remains one of the countries with most children at work. UNICEF estimates that there are 33 million child laborers in India. In July, the Child Labour (Prohibition and Regulation) Act (CLPRA), 1986 was amended and it has received positive comments but also critique that the changes increase the risks for the most vulnerable and exposed in our society rather than reduce and protect. 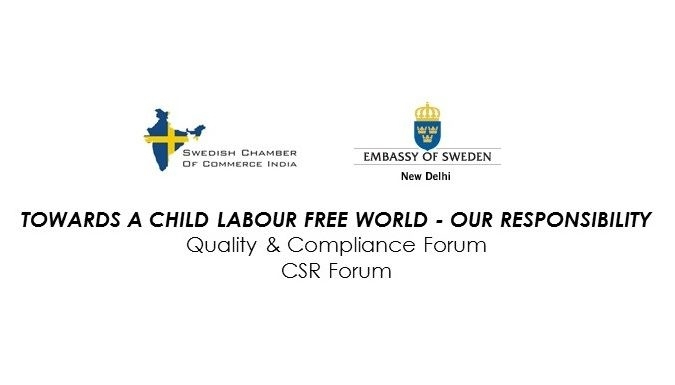 Under the umbrellas of the Quality & Compliance Forum and CSR Forum for representatives from Swedish companies in India, the Swedish Chamber of Commerce India in collaboration with the Embassy of Sweden invites you to a discussion on the implications of the CLPRA Act and how businesses can identify and manage risks related to child labour. We have also invited ILO (International Labour Organization) and Save the Children to join us as Knowledge Partners. · Overview and a practical perspective of CLPRA. What are the compromises of the law in the overall picture of children’s rights? · Risk management - what do we need to look out for, in existing supply chains or when new vendors are developed? · How to address and ensure the eradication of child labour in the supply chain? We welcome you and look forward to hearing from you regarding your experiences towards this. This forum is for anyone interested in the subject, but maybe especially of interest for those in the area of Quality & Compliance, CSR and Sustainability. Please register here the latest by September 23.